Just imagine, after swiping to the left a few times, you finally get ‘It’s a match!’ After a bit of chatting, you decide to meet up. Fine, you both check your schedule, decide on a day and your date is set. Only on the day itself you get the ominous message with: “You can decide where we meet!” This can cause some panic, but luckily I have selected 6 great places for a date in Rotterdam. You’ll have a great time with your new crush for sure. Check it out! Le Nord is a cute, little cafe at the Proveniersstraat (just behind Central Station, so very convenient if you have to pick up someone from the train). Both inside and outside are cozy. The menu has a lot of beers and wine, and if you want to be decadent, you can put together a cheese board. If you can’t think of any topics for conversation, you can always decide to break the ice by playing one of the available games. If the tropical décor of Tiki’s doesn’t lure you in, you obviously haven’t tasted the delicious cocktails yet (my personal favorite is the pussyjuice). During the week you can hang out a bit, in the weekend it’s crowded and fun, which makes it difficult not to order one drink – or ten. Once you set foot in Kaapse Maria, you immediately feel relaxed because of the interior and a wonderful living room vibe and then we haven’t even mentioned the delicious (local) beers and delicious wines. Choosing the traditional drinks at the bar gives you enough to talk about, you can’t go wrong with names like ‘Mooi & Meedogeloos’ (translation: Beautiful & Relentless). It’s also the ideal place to order a bite with your drink. It would be 100% perfect if you could manage to confiscate the only place on the balcony. It’s dark, it’s sultry, it’s private. Stirr is a place to lift your date to a higher level. The exciting thing about this cocktail bar is that there is no menu card, but the bar staff makes everything based on your wishes. This makes every cocktail a surprise and small masterpiece. Sometimes the conversation is a bit over and then you just want to enjoy each other’s presence. In that case you can visit Dizzy. Wonderful music that you can fully absorb. Dizzy has been around in Rotterdam for years and therefore there is also a wonderfully varied crowd and of course there are tasty drinks. Bonus: they have a lovely garden! 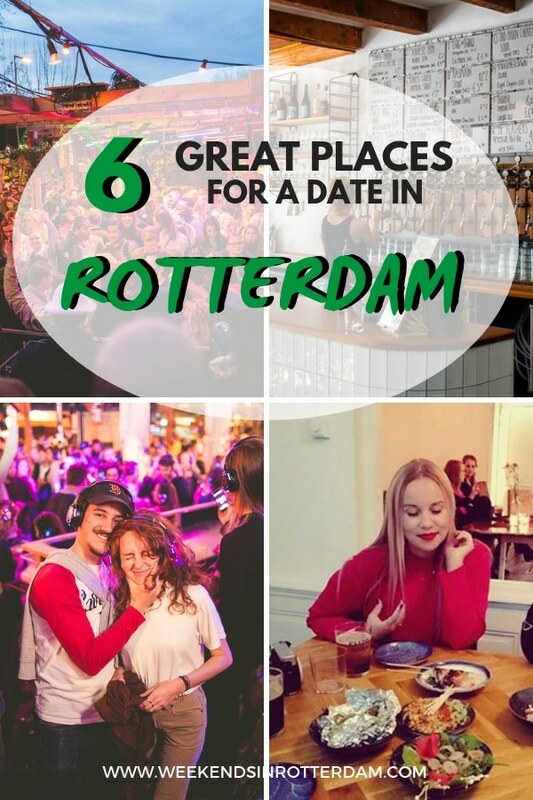 Do you have any tips for a nice place for a date in Rotterdam as well? Let us know in the comments below.